Germany faced Portugal in their opening Group G match, with Germany winning 4-0 and Pepe being an idiot (surprise, surprise). Faced with the decision on which diminutive gifted midfielder to leave out of the starting eleven, Jogi Löw just went ahead and picked all of them. Furthermore, Germany’s best fullback, Phillip Lahm played centre midfield. Ronaldo was fit enough to start for Portugal. 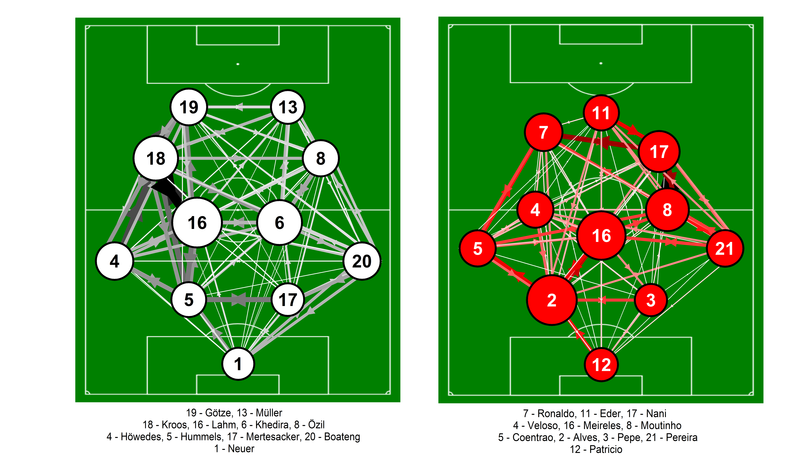 Below are the passing networks for both Germany (left) and Portugal (right) based on data from Fifa.com. More information on how these are put together is available here in my previous posts on this subject. For Germany, I’ve not included the substitutes as they contributed little in this aspect. For Portugal, I included Eder who came on for the injured Hugo Almeida after 28 minutes. Passing networks for the World Cup Group G match between Germany and Portugal at the Arena Fonte Nova, Salvador on the 16th June 2014. Only completed passes are shown. Darker and thicker arrows indicate more passes between each player. The player markers are sized according to their passing influence, the larger the marker, the greater their involvement. Click on the image for a larger view. 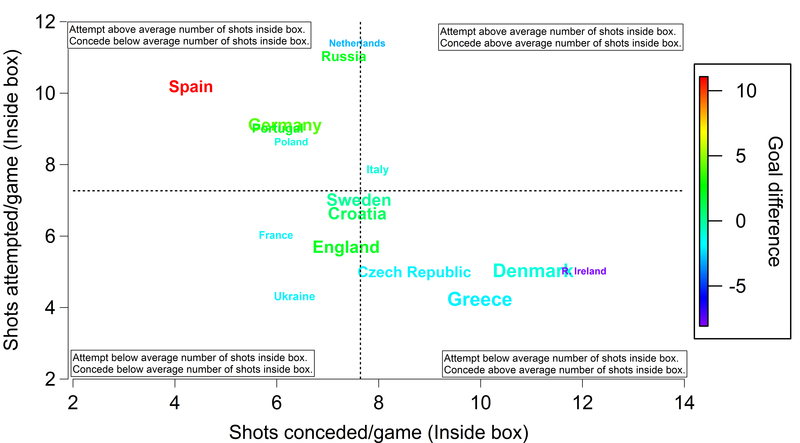 Bear in mind that the passing networks above are likely skewed by game state effects, with Germany leading and playing 11 vs 10 for a large proportion of the match. Germany lined up with something like a 4-1-5-0 formation in the first half, with their full backs being relatively unadventurous, Phillip Lahm playing ahead of the centre backs with Sami Khedira running from deep and often beyond his attacking compatriots. Khedira was less aggressive in the second half with Germany three goals ahead and with a numerical advantage. In the graphic above, I’ve got them lined up in a 4-2-4ish formation based on a mixture of their average positions and making the plot look pretty. In reality, the side was very compact with the central defenders playing a high line and the attackers dropping off continually. Lahm and Khedira provided a controlling influence for Germany, forming the link between the defence and attack. Höwedes and Boateng were also well involved in build-up play, although they had limited involvement in terms of direct creativity, with just one cross and no key passes between them. The attacking quartet were all about fluid movement and passing links, as can be seen in the passing network above. Kroos was similarly influential to Lahm/Khedira but with a slightly higher position up the pitch. Özil and Götze were also heavily involved, while Müller was the least involved (unsurprisingly). The relative balance between the German play-makers meant that their attacks were not simply funnelled through one individual, which led to some lovely passing inter-changes and several high-quality shooting opportunities. Portugal’s passing network was dominated by their central midfielders but they struggled to involve their attacking players in dangerous areas. Ronaldo in particular saw relatively little involvement and the passes he did receive were often well away from the danger-zone. The one Portuguese attacker who was well-involved was Nani; unfortunately for Portugal, he put in a fairly terrible performance. Despite his involvement, Nani created no shooting opportunities for his team mates and put in a total of six crosses with none finding a fellow Portuguese. He did have three shots, with one on target. Sometimes a relatively high passing influence is a bad thing if the recipient wastes their involvement. Portugal did look dangerous on the counter-attack prior to Pepe’s sending off but failed to really create a clear chance from these opportunities. 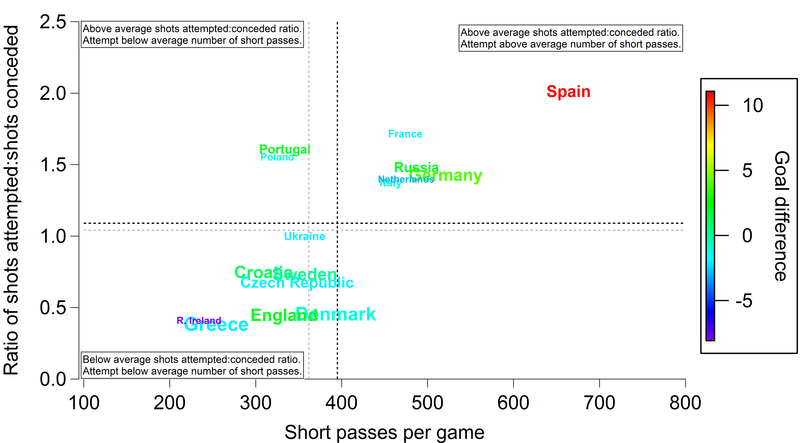 Overall, Portugal’s passing network was too heavily weighted away from their (potentially) dangerous attacking players and when they did get the ball, they didn’t do enough with it. Germany were impressive, although this was likely facilitated by Pepe’s indiscretion and the game being essentially over at half-time. The game conditions were certainly in their favour but they capitalised fully. If they can keep their gifted band of play-makers weaving their magic, then they will do well. They’ll need Müller to keep finishing their passing moves, while Mario Götze found himself in several promising shooting situations which may well yield goals on future occasions. Conversely, Portugal were hampered by the match situation although they looked worryingly dependent on Ronaldo in attack, as noted by the imperious Michael Cox in his recap of day five. Furthermore, the USA likely won’t give them as much space to attack as Germany did. They’ll need to improve the passing links to their dangerous attackers if they are to have much joy at this tournament.